After a great few busy days, including some off of work to spend time with my Mom who was visiting from North Carolina, the last thing I felt like doing was wash my hair. But I couldn't take how dry my hair was starting to feel and my scalp was starting to itch. Ultimately I kept my wash day simple and stuck to what's worked in the past. I pre-pooed for over an hour with Dessange Oleo Replenishing Oil Conditioner. Yes, I know I said I didn't care for it, but may be ok as a pre-poo conditioner and using it this way allows me to get rid of it. I decided to clarify my relaxed hair this time using the SheaMoisture Jamaican Black Castor Oil Shampoo. To make sure I really got it on my scalp I mixed a little bit of the shampoo with some water in an applicator bottle. Next was the green tea, apple cider vinegar rinse that I massaged into my scalp and left in while I deep conditioned for 40 minutes with Eden BodyWorks Jojoba Deep Conditioner and my Hot Head Deep Conditioning Cap. After rinsing the hair rinse and deep conditioner out I air dried my hair. I did this by wrapping my hair up in a t-shirt and leaving it wrapped up for about two hours. Next, I applied Nothing But Melted Shea Butter for leave-in and sat under my hooded dryer for an hour using cool heat. My hair wasn't fully dry but was close enough. 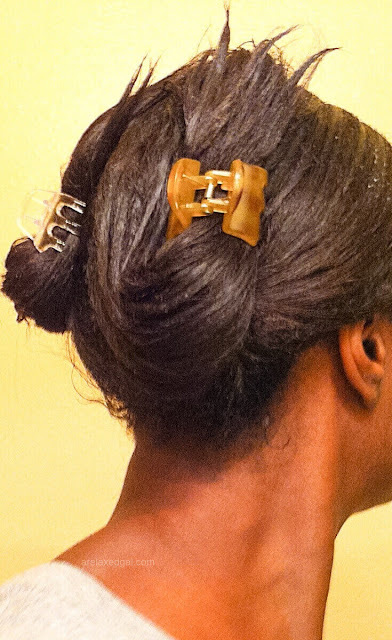 Finally, I sealed my relaxed hair with grapeseed oil and used a few satin pillow rollers to give my ends some curl. In the morning I didn't like how the curls looked and my ends felt dry. 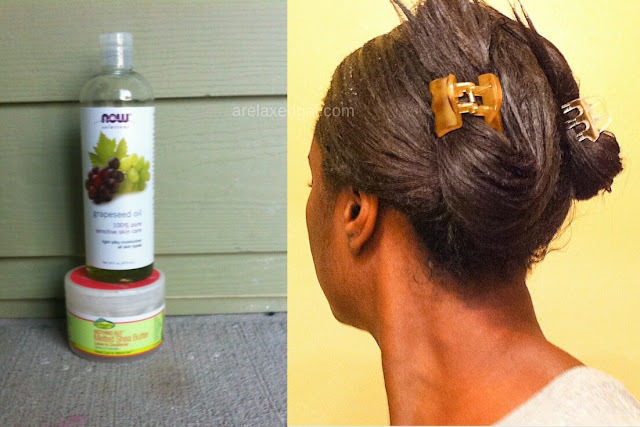 Since I was headed out to church I applied Eden BodyWorks Coconut Shea Leave-In Conditioner on my ends and pulled my hair back in a half ponytail. I love how thick and full your hair is. Awesome washday! I agree with Tomes, your hair is so thick -- I absolutely love it. I love all that texture in your hair! I need to follow your footsteps and start using my "not-so-great" conditioners as a pre-shampoo! Genius idea! How many satin rollers did you use to get your curls? My new growth is good though it seems to be coming in faster than normal. Not complaining though. Thanks for reading. !